Activity Space/Track: Four activity courts adaptable for basketball, tennis, volleyball and badminton. Surrounding the four activity courts is a 200-meter indoor six-lane track. 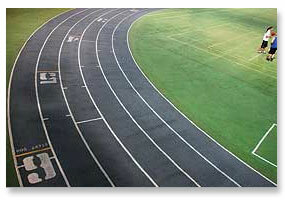 Selected activity courses, teaching methods courses and coaching courses utilize this facility. Dance Studio: A large, open, hardwood-floor facility with mirrors on two walls; includes a sound system. Classes in dance, relaxation, self-defense and yoga are taught in the Dance Studio. 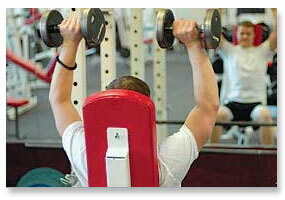 Weight Room: Located in the Gillett Recreation-Fitness Center, it spans two rooms. A machine weight room features FreeMotion, Strive and Cybex equipment. The free weight room features Magnum, Cybex and FreeMotion benches. Weight Training, Lifetime Fitness and selected teaching methods and coaching courses utilize this facility. Racquetball Courts: Five racquetball/handball courts that can also accommodate wallyball are used to teach racquetball courses. Students enrolled in the volleyball course often get the chance to try their hand at wallyball. Climbing Wall: A state-of-the-art, authentic rock-design climbing wall is located in the corner of the recreation center activity space/track. It accommodates up to six belayed climbers. The Rock Climbing course, Adventure Programming course and selected teaching methods courses utilize the climbing wall for instruction. Pool: Located between the recreation center and the Physical Education complex, the pool has six lanes and is 25 yards long; includes two diving boards with a depth ranging from 3.5 to 12 feet. Beginning Swimming, Intermediate Swimming, Advanced Swimming, Lifeguard Training, Water Safety Instructor and Adapted Aquatics courses are conducted in the pool. Gymnasium: Located in the Physical Education Complex, this hardwood-floor facility offers a three-court basketball or volleyball set-up, or a main court configuration with bleachers on both sides. A center dividing door offers students in teaching methods courses the possibility of two independent instructional settings. Outdoor field spaces/courts: Students in selected activity and methods courses utilize field space adjacent to the Physical Education Complex. A softball field and soccer practice field provide outdoor locations for instruction.